Perfect cottage for a couple! Furnishings are very comfortable, kitchen is wonderfully equipped, and the "feel" of the space is light and fashionable. Cottage is in walking distance to Bends best restaurants and gourmet grocery store. The management company is responsive and gracious. This is a fabulous spot! Great place, super comfortable, prime location, easy to book. I couldnt ask for a better experience. Thanks! Wow, what a beautiful rental. It was supplied with everything a guest might want, including a most comfortable bed. Being within a very short walking distance of grocery stores and wonderful restaurants , is also a plus. Ive stayed in VRBOs in New York City, but this one is by far the nicest. Youve put a lot of love into making your rental comfortable and welcoming. Ill definitely return. We booked last minute and it couldnt have been easier. Wonderful, cozy cottage for me, my husband and our 5 month old daughter. Quiet neighborhood in a fantastic location. 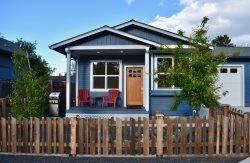 Very walkable to Newport Market, Back Porch Coffee Roasting, Chow, etc. We walked through Drake Park and over to downtown. The storage shed was very convenient for our stroller, but would be great for bikes, skis, etc. The apartment itself was very clean and neat, with comfortable furnishings. We didnt do much cooking, but the kitchen was well stocked with pans, plates, glasses and utensils. The owners were so nice, even mailing a stray baby sock back to us. We would stay here again.